GREENSBORO, NC (March 20, 2018) – Mack Trucks and Richard Petty Motorsports today announced an expansion of their partnership, under which a Mack Anthem® will haul the legendary number 43 racecar currently driven by Darrell “Bubba” Wallace Jr., one of the brightest young stars in NASCAR today. The expansion also makes it possible for Mack to offer customers even more unforgettable experiences at tracks around the country every weekend. Wallace came in second in the 2018 DAYTONA 500 in February, making NASCAR history with the best performance by an African-American driver. 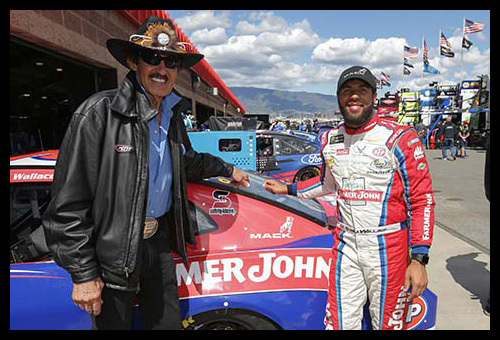 Wallace is the first full-time African-American NASCAR driver since the 1970s. Attendees of the 2018 Mid-America Trucking Show March 22–24 at the Kentucky Exposition Center, Louisville, Kentucky, will have the opportunity to meet Richard Petty in the Mack Trucks booth 34105 the morning of Thursday, March 22.